We think everyone should wake up to a cute owl stocking stuffer on Christmas morning, because honestly, what's not to love when it comes to these adorable forest critters? That said, we've gathered up plenty of owl goodness for kids (and adults) of all ages. Our guide kicks off with a super sweet pair of Wool Felt Love Owls. 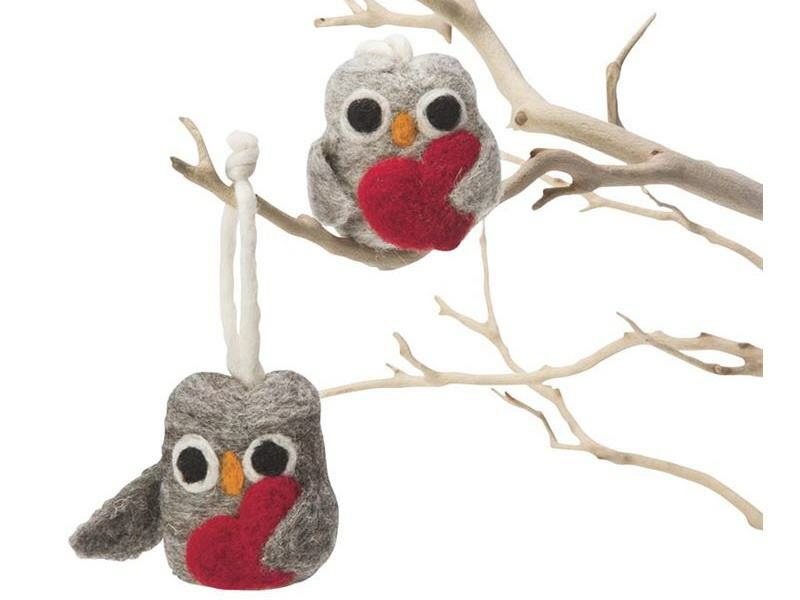 These needle-felted wool owls offer up charm and love on Christmas morning and their little loops offer a great way to hang these fellas on a tree. Each owl is very lovable, holding tiny red hearts and will delight owl-loving kids and adults alike. Keep reading to see more cute owl stocking stuffers! 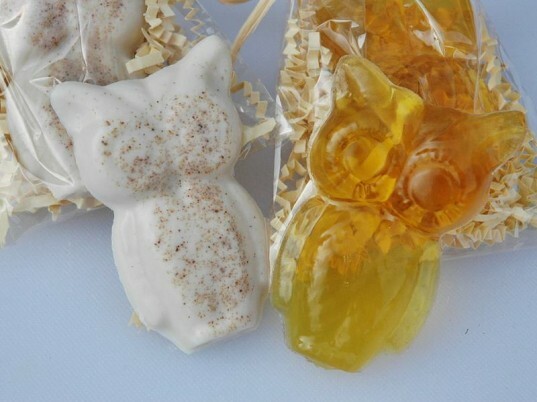 Kids will love getting squeaky clean with this cute soap. Handmade to order with all organic and natural ingredients, this soap is as kid-safe as it is fun. No chemicals, no fake colors, just wonderful organic buttermilk, organic honey, organic aloe vera gel, organic safflower oil, organic oatmeal, organic soybean oil for safe, ultra soft skin nourishment. This soap works for all skin types and anyone with sensitive skin and is 100% fragrance free. Soap comes stocking ready, packaged with natural raffia and warm vanilla crinkle paper. For the babies on your list, roll them up a cute blanket and add it to their first Christmas stocking. 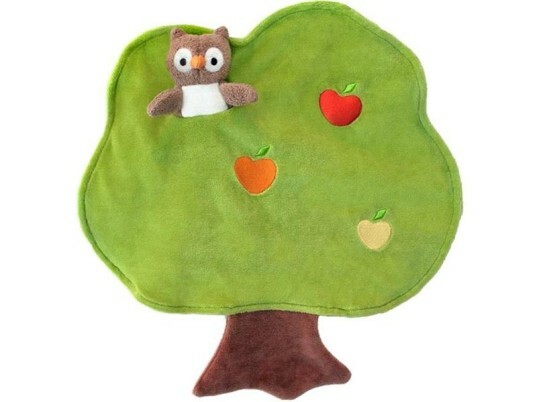 This snuggly 100% organic cotton Who, The Owl, Picnic Pal Finger Puppet Blankie has natural corn fiber filling and an adorable little finger puppet owl to make baby laugh. The blanket comes packaged in 100% recycled paper printed with soy ink and bonus, the blanket rattles to provide an extra sensory experience for little ones. These little wool owls are one-of-a-kind and absolutely adorable. Each tiny owl is hand-knit with luxuriously soft, high-quality alpaca and merino wool. This owl is winter ready in his fluffy little hat and makes a great ornament, office companion, toy, room decoration and more. You can get this owl custom made with any color you like and an ornament loop can also be attached if desired. If you’re interested in a different sort of owl hat, check out the sweet little autumn owls who come complete with acorn cap hats. This cute natural owl rattle is handmade with nothing more than real cherry wood from certified sustainably harvested trees, organic camelina oil and beeswax so it’s safe for babies to shake, rattle and even chew on. You can have a personal touch added to the rattle, such as your baby’s name if you’d like, and due to safely enclosed BBs, each owl heirloom rattle makes a pleasant, gentle rattling sound – just right for stimulating baby’s senses. Your owl comes in a pretty USA-made cotton drawstring bag and the company donates funds to Peace Corps youth development programs around the world for every toy sold. Night Owl Paper Goods’ soft owl plushies aren’t suitable toys for young children but they are perfect for older kids who like owls. 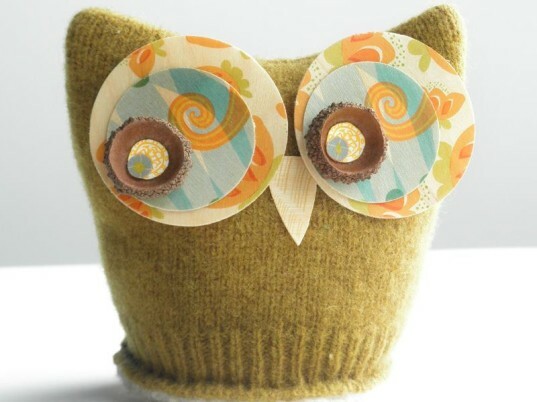 Each and every owl plushie sold is 100% one-of-a-kind, handmade by local crafters with sustainable materials such as repurposed wood and letterpress bits, all natural, real acorn eyes and upcycled woolen sweaters. For younger kids or a smaller stocking stuffer, check out the cute owl rulers this shop offers. We super adore Maple Shade Kids; especially their hyper cute and colorful owl goodies, such as these beautiful owl art clips. These useful and cute owl clips come in every color imaginable and can be used by kids to proudly display their best works of art. 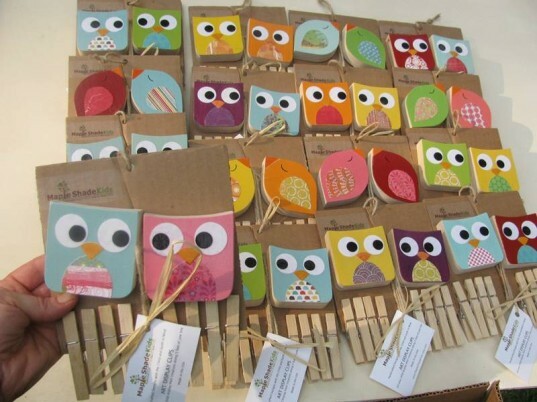 Each set comes with 2 owls on a jute twine, eight clothespin holders, and a keyhole for easy hanging. Your child can also use these clips to hang mittens, organize papers on her desk, and much more. All clips are made with Forest Stewardship Council (FSC) certified poplar wood, colored with non-toxic paint, and made with non-toxic sealer and non-toxic glue. Its great creative stuff. Thanks. 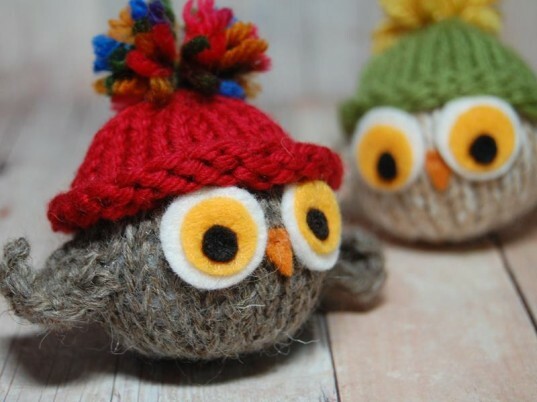 These little wool owls are one-of-a-kind and absolutely adorable. Each tiny owl is hand- knit with luxuriously soft, high-quality alpaca and merino wool. This owl is winter ready in his fluffy little hat and makes a great ornament, office companion, toy, room decoration and more. You can get this owl custom made with any color you like and an ornament loop can also be attached if desired. If you're interested in a different sort of owl hat, check out the sweet little autumn owls who come complete with acorn cap hats. 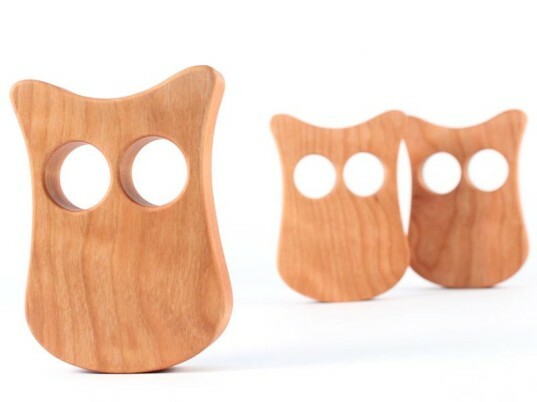 This cute natural owl rattle is handmade with nothing more than real cherry wood from certified sustainably harvested trees, organic camelina oil and beeswax so it's safe for babies to shake, rattle and even chew on. You can have a personal touch added to the rattle, such as your baby's name if you'd like, and due to safely enclosed BBs, each owl heirloom rattle makes a pleasant, gentle rattling sound – just right for stimulating baby’s senses. Your owl comes in a pretty USA-made cotton drawstring bag and the company donates funds to Peace Corps youth development programs around the world for every toy sold. Night Owl Paper Goods' soft owl plushies aren't suitable toys for young children, but they are perfect for older kids who like owls. Each and every owl plushie sold is 100% one-of-a-kind, handmade by local crafters with sustainable materials such as repurposed wood and letterpress bits, all natural, real acorn eyes and upcycled woolen sweaters. For younger kids or a smaller stocking stuffer, check out the cute owl rulers this shop offers.